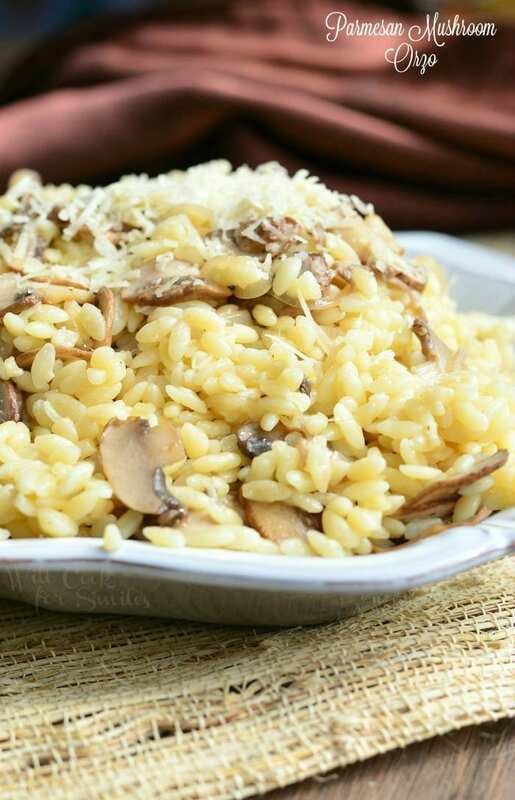 Delicious whole mushroom side dish. 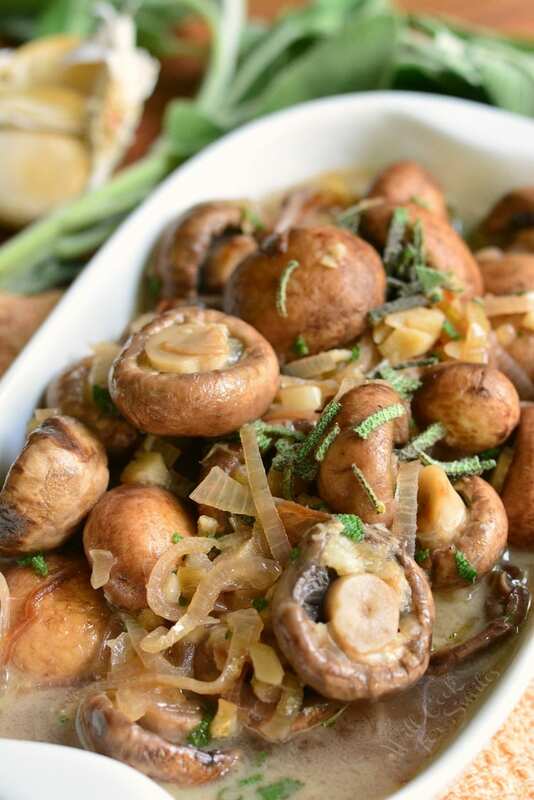 Baby portobello mushrooms are first sauteed with garlic, shallots, and fresh sage. 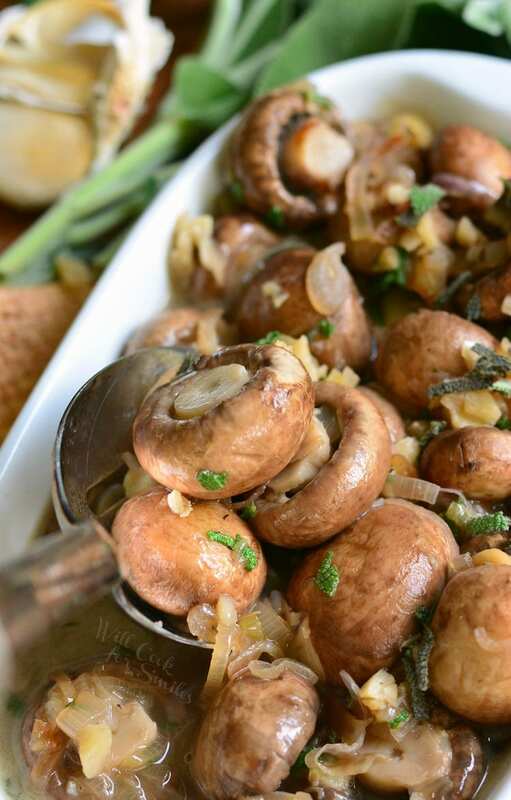 Then, these mushrooms are simmered in a simple white wine sauce. Do you have any fun holiday traditions with your family? May be you have certain foods that you eat for holiday dinners, or certain rituals that your family does during the holidays, or even something you wear that became a holiday tradition? Most of the family traditions that my husband and I started are related to Christmas. We always get the tree and decorate the house on the same day, every year. We have our traditional Christmas tree decorations and stockings. We always open one present each on Christmas Eve and then, open all the rest of our presents on Christmas morning. Our family also comes to our house every year for Christmas dinner. It’s been that way for the past 10 or so years and I don’t see it changing. It’s comforting to have holiday family traditions. What is NOT traditional every year is my Christmas menu. I make something different every single year. For Thanksgiving on the other hand, we have a very traditional menu. My husband would not budge even a little bit when it comes to Thanksgiving. He gave me free reign about what I serve for Christmas but Thanksgiving, I can’t deviate from the menu. It’s always turkey, mashed potatoes, stuffing, gravy, cranberry jello mold, and sweet potato pie. It took me a few years, but I’ve managed to talk him into letting me serve two fresh vegetable sides and make them different every year. Most of the time, I do something with green beans since everyone loves green beans. Some times I saute them with almonds and onions and other times, I make them with cranberries and pecans. As far as another fresh vegetable side, I either make carrots, or spinach, or mushrooms. This year, I’ve decided on mushrooms. These beautiful whole mushrooms are perfect for the holiday turkey dinner. They are made with shallots, garlic and sage. 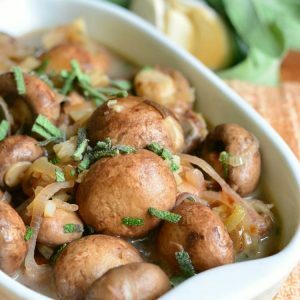 Fresh sage flavor really comes through in this mushroom dish and will make a great compliment to turkey, chicken, or duck. 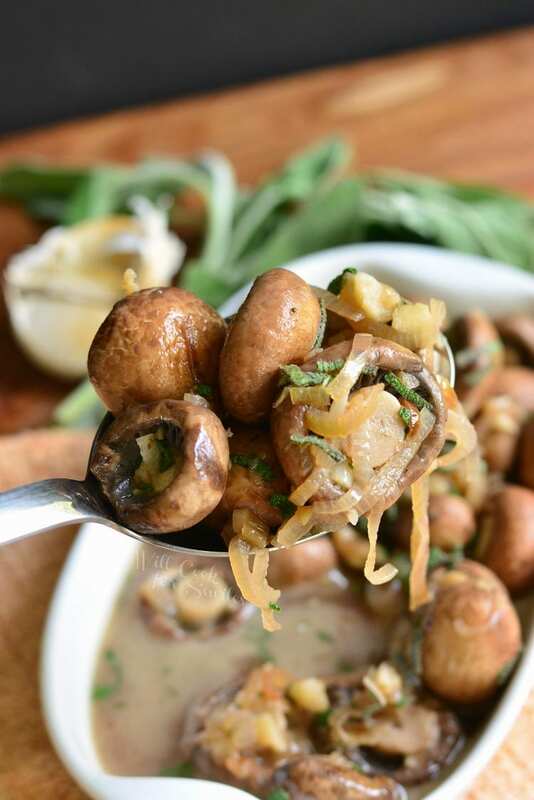 Baby portobello mushrooms are first sauteed with garlic, shallots, and fresh sage. 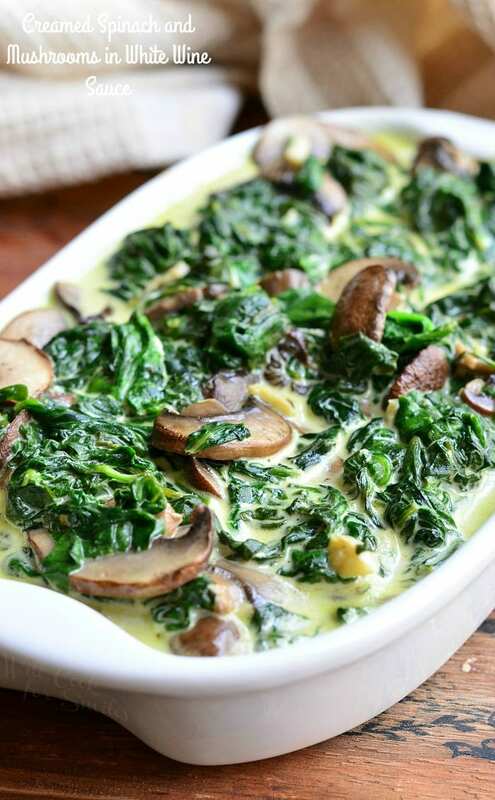 Then, these mushrooms are simmered in a simple white wine sauce. Wash mushrooms and cut off stems. Set aside. Preheat a large cooking pan over medium heat. Add canola oil and heat through. Slice shallots thinly and add to the cooking pan. Cook until fragrant. Add mushrooms and pressed garlic. 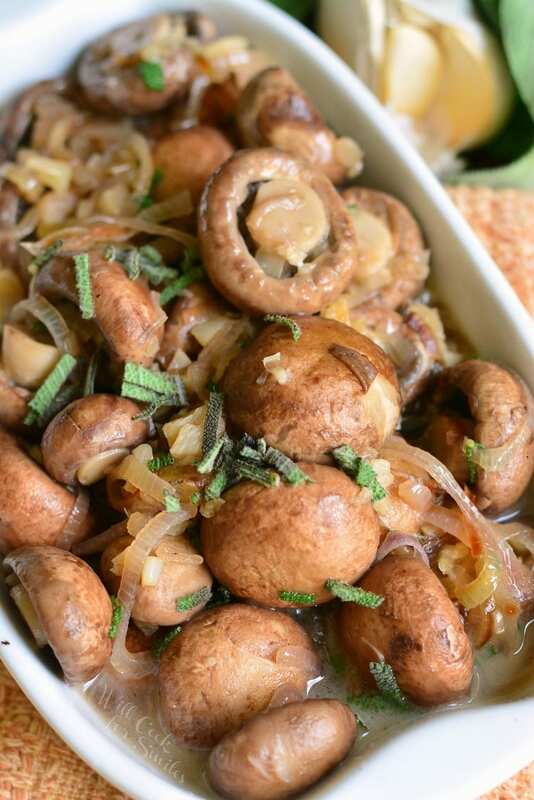 Mix and saute mushrooms, garlic, and onion for 7-10 minutes. 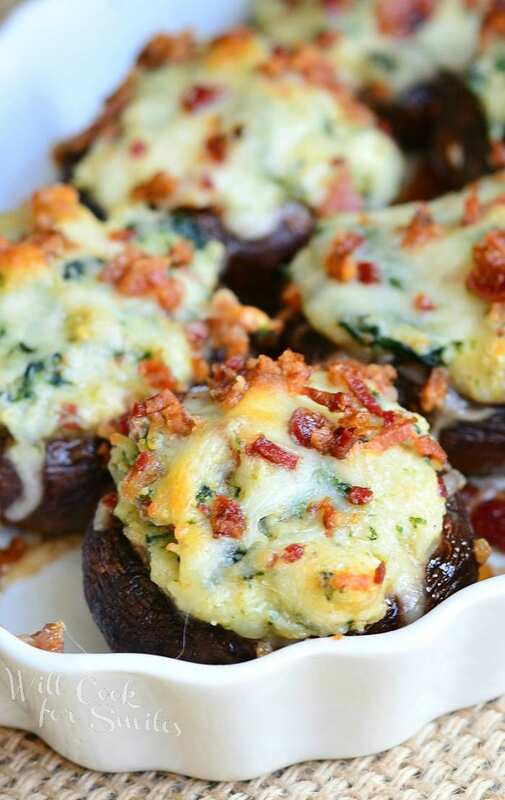 Sprinkle flour over mushrooms and mix well. Pour in white wine, mix and let it simmer for about a minute. Add broth and mix everything well. Add diced sage and stir well. Season with white pepper and salt. Cook another 5-7 minutes. I made your mushrooms with fresh sage yesterday as part of my Thanksgiving dinner. Made a couple of changes because of what I had on hand. Used a Pinot noir for the wine & beef broth. Also cooked them a bit longer. The sauce was so rich and good. Thank you for this delicious recipe.